We are happy to announce that after 2 years doing a research on Santiago General Cemetery through several lines of action, the funerary complex administration signed a Collaboration Agreement with UC Architecture School. This process is led by Plan Común and includes a historical research, a survey of the current situation and several projects. Diego Grass was invited to give a lecture about the recent works of Plan Común at Tokyo University of Arts. The presentation was proposed and organised by Japanese architect Ryuji Fujimura who visited our office last month, reviewing our last investigation project in Santiago General Cemetery. Japanese architect Ryuji Fujimura visited Santiago to review "Santiago General Cemetery:, an ongoing research led by Plan Común. In his visit to our office we discuss with him about recent works and the limits of participation. Ryuji Fujimura was also invited to present his practice, works and the participative process he explores in his projects in a lecture at the School of Architecture of the Pontificia Católica Universidad de Chile. Fuzinetlon in Nove Fuzine district in Ljubljana, is an event organised by a local community center with SPM, a non-governmental organisation dedicated to the fields of social integration, education and sport, dealing with the target group of socially disadvantaged children and their families. Within the different proposed activities, this year's edition of the event will benefit from our last built project "Common Places : Micro-intervetions in Nove Fuzine", a series of multi-use brick plinth, spread through the district, that acts as a support for various public activities and urban manifestations. "Common Places: Urban Playgrounds for Amadora", exhibition by Plan Común, including contributions by Bruna Canepa, Marcelo Cox, Dyvik Kahlen, Hamed Khosravi, Ciro Miguel, Np2f, Tsubame Architects, Lavinia Scaletti, Tiago Torres Campos and Umwelt. This project is part of ‘The Limits of Landscape’ satellite exhibition of Lisbon Architecture Triennale 2016 presented in Casa Roque Gameiro in Amadora, with the support of Future Architecture Platform, the first pan-European platform of architecture museums, festivals and producers, bringing ideas on the future of cities and architecture closer to the wider public. Felipe de Ferrari and Kim Courrèges of Plan Común were invited to give a lecture during the symposium : "Common Luxury : Less private space, More collective space" at the Swiss Architecture Museum in Basel, curated by Andreas Ruby. From the curator: “When we think of luxury, we usually think of individual wealth. The more unattainable this exclusive form of luxury becomes for the majority of society, the more clearly a new understanding of luxury emerges today, defined by collective partaking of goods and services. Likewise in architecture the sensibility is growing towards the communal and the shared as well as the meaning of public space as a prerequisite for democratic societies. In this symposium architects from nine different countries report on how “common luxury” is increasingly becoming an attribute of the contemporary urban way of life." Other participants include Georgeen Theodore, Interboro (USA), Max Turnheim, UHO Architects (FR), Something Fantastic (DE), URBZ (IN), Anna Puigjaner MAIO (ES) and Jack Self, REAL Foundation (GB) among others. MAO presents Common Places, a commissioned project by Chilean-French architecture office Plan Común and the Portuguese landscape architect Tiago Torres-Campos. Common Places is a series of brick constructions located in Nove Fužine, a part of Ljubljana where MAO is situated. Plan Común and Tiago Torres-Campos have designed five multifunctional plinths, which are strategically positioned over the entire neighbourhood: in the museum courtyard, along the river, in the historic garden, in front of the community centre and behind the famous city bus stop, designed by Saša J. Mächtig in the 1960s. The plinths build, encourage and reinforce different uses of public space and create specific relations with the surroundings. They intend to become platforms for contemplation, meeting points, stages for events, concerts or lectures, or simply structures on which to sit and enjoy the communal life of the neighbourhood. The opening of the exhibition coincides with the kickoff event for 25th Biennial of Design: Faraway, So Close, also organised by MAO and curated by Angela Rui and Maja Vardjan. The exhibition is part of Future Architecture platform programme. 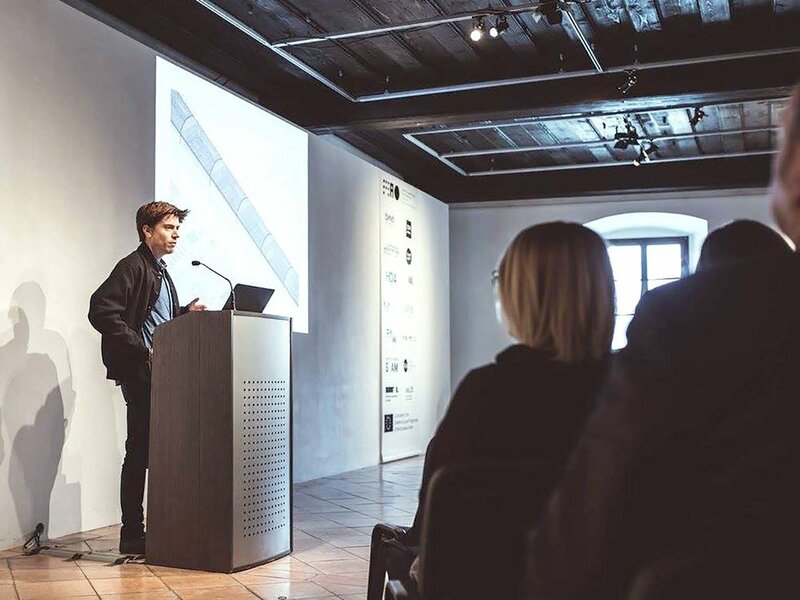 Future Architecture platform is a European platform of architecture museums, festivals and producers that highlights the emerging generation of talents in various disciplines and enables them to present their ideas about the future of cities and architecture. The reinforced concrete structure is rising at the construction site in San Javier. This low-cost construction is situated in the city center, right in front of the municipal town hall. The institutional building, which is one of the only building offering a public space in front of its entrance in the city center, will be followed by a new intervention, brought with this commercial new building: a new public space generated by strategic position in the site, creating a diagonal façade that create a small square in front of it and in continuity with the existing square in front of the town hall. A regular and functional structure that allows, thanks to its economy, to produce and give a new public space to the city that will be completed with a new pavement, a large concrete bench and a new tree. Plan Común co-organized the second edition of W.A.S 2016 at UC Architecture School. This event was also the second edition of a series of workshops focused on Santiago's General Cemetery and included the participation of German architect Wilfried Kuehn (Kuehn Malvezzi) as invited architect. The workshop proposed a series of micro-interventions in the northern area of the Cemetery -the most critical zone of the funerary complex-, in order to enhance its uses toward the idea of public space. We congratulate the participant teams from six different schools of architecture in Chile and Perú. Plan Común has been invited to exhibit the on-going research project "Common Places" at MAXXI, in Rome, in an event co-organized with Future Architecture Platform. 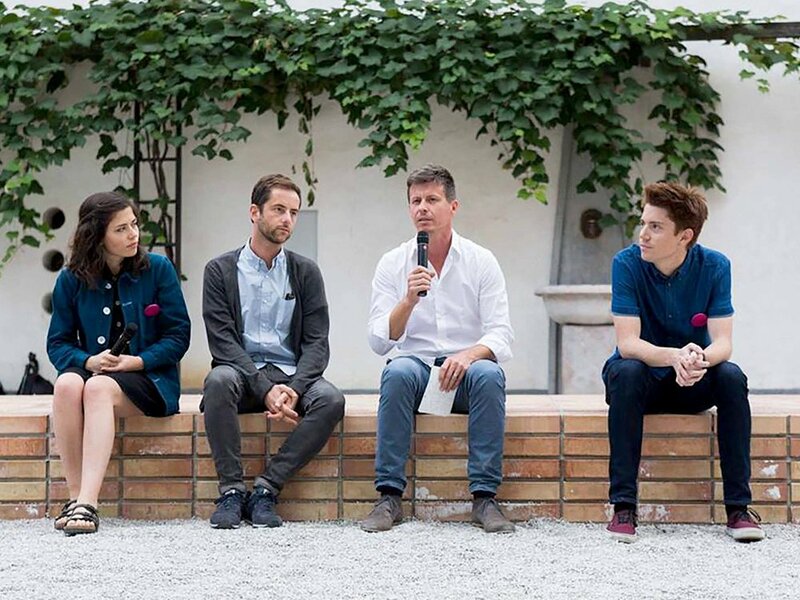 From the curators: “The program objective is to identify young groups of professionals, creative talents and enthusiasts from different parts of the world whose ideas are able to tell us the future of architecture. In line with its nature, MAXXI chose to relate to the Future Architecture Platform project with its consolidated strategy of promoting young talents, presenting the artworks of five of the 25 finalist groups in the exhibition. Through their exhibited projects, Future Architecture Platform finalists help us understanding how architecture may play a role in our future societies thanks to innovative solutions in the field of technology, of social space, in the relationship between architecture and its users, as well as in the very same idea of construction and cooperation." Plan Común has been invited to participate in the exhibition "Form Follows ...", organised by House of Architecture in Graz (HAD) and curated by ISSSresearch -in the context of Future Architecture Platform-, with a proposal for the transformation of Andreas Hoffer Platz in Graz, Wien. From the curators: "The "Form Follows ..." exhibition at the House of Architecture - HDA - in Graz will allow visitors to discover the intellectual and practical universes of nine optimistic, young architectural positions/practices that develop possible answers to relevant societal questions in order to get an insight about what drives them in their designs. Optimism is an attitude that allows us to stay capable of giving form to architectural ideas in a globalised world, where crisis has become a permanent socio-economic condition and describing it a major academic occupation." Diego Grass of Plan Común was invited to give a lecture at the School of Architecture of the Catholic University in Peru, presenting Plan Común recent works and "Common Places" a collective research about public space typologies. The lecture also included a presentation of the content of the audiovisual archive of architecture projects and interviews, OnArchitecture. Felipe De Ferrari participated in ‘Crítica y Celebración’, a series of debates initiated by Ernesto Rodríguez at Centro de Estudios Públicos. Entitled ‘Arquitectura y Política’ the event also included presentations by Rodrigo Pérez de Arce, Francisco Díaz and Cristián Izquierdo. Excerpt from the presentation: “Esto porque en la construcción de nuestras sociedades hay mucho en juego. Lo que hay en disputa es la cultura, el mundo en el que queremos vivir y evidentemente el que queremos transformar o construir como arquitectos –incluso los encargos que queremos recibir-. Lo que hay en disputa es el imaginario y los valores que nos permiten ser felices y realizados colectivamente, el sentido común”. Felipe de Ferrari of Plan Común, chilean architect and filmaker has been invited to give a lecture at Harvard Latin GSD lab, and will present the reseearch, work and methodology of Plan Comun Architects and its connection with the audiovisual archive OnArchitecture. Common Places is an series of 50 formal strategies aiming at maximizing public space, led by a team of 50 architects from Europe and abroad. It is a set of architecture projects for our cities, prototypes questioning the validity of established ideological and/or normative models in order to reproduce new and fertile public spaces. This collective authorship project aims at influencing architects and decision makers beyond our field. OnArchitecture (audiovisual archive of architecture videos and interviews) of Felipe de Ferrari & Diego Grass has been invited to showcase some of their content at Solo Galerie in Paris, in an exhibition open to the public and showcasing works of different architects such has Lina Bo Bardi, Bruther, NP2F, Lacaton & Vassal, Office KGDVS, TNA, SANAA, Atelier Bow-Wow, Cecilia Puga, Andra Matin and Arno Brandlhuber. Felipe de Ferrari and Diego Grass has responded to an interview made by the online platform urbanNext, a global network to produce content focused on rethinking architecture through the contemporary urban milieu. In this interview, are discussed various on-going project by Plan Común, such as the current research project on public space called "Common Places", and the relation with On Architecture, the audiovisual archive of architecture founded by Felipe de Ferrari and Diego Grass back in 2012. Plan Común, among other architects such as Adamo Faiden, Fala Atelier, Go Hasegawa and Grafton architects, to participate in an exhibition in London, which would expose different architects visions –including strategies and projects by Adamo Faiden, Go Hasegawa or Fala Atelier just to name a few- of the notion "Unfeasible". An abstract from Plan Común's proposal, a continuous infrastructure across Latin-America : "The proposal goes beyond the reparation of an unfair settlement more than 100 years ago: it is a gesture of solidarity between two brotherly countries, a step forward into reuniting Latin American people. This historical debt is not only with Bolivia." "Think Space" serves as a platform for spatial experimentation and conceptual exchange of ideas. Each cycle lasts a calendar year and is constituted by competitions under the annual theme. At the end of the cycle, a conference, award ceremony and exhibition will be held in Zagreb. The Think Space Programme in 2015 is returning in form of a Special Edition under the topic THINK public SPACE. The focus of this Special Edition will be directed on urban public space in the European context. Plan Común has been awarded with an honorable mention with the proposal "Reclaim City Space" : our proposal, extracted from the research project "Common Places" is to radically approach 10 generic situations we recognized in Zagreb and abroad, all of which are affected by this ongoing privatization, turning them back in favour of public sphere: urban growth, land use, infrastructure, pedestrian flow, public transport, higene or even our perception of the city, collective memory and the limit between public and private. The research was focused on developing projects in two joint districts in the city of Santiago: Recoleta and Independencia. Both municipalities were selected for their cultural and historical richness, two emblems of a city model in dangerous retreat. Given its privileged position in the metropolitan context, both municipalities begin to succumb to the strong pressure of real estate, an area where these interests have detected a paradoxical growth: by intangible conditions of a cultural nature, such development doesn't exploit the full potential of a sector, through good and numerous infrastructures and connection with the rest of the city. In such context, the General Cemetery appear as a contention toward the expansion of the private city as it can be designed as a center of gravity for both municipalities.